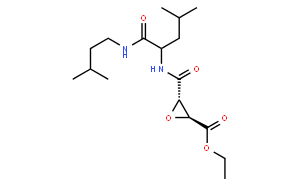 E-64d is an inhibitor of cathepsins B and L as well as a potential inhibitor of calpain. E-64d has been shown to inhibit lysosomal proteases. E-64d has been used in combination with Prepstatin A to interfere with autolysosomal digestion. E-64d displays neurovascular and neuronal protective effects after focal cerebral ischemia in rats.